Hotel Tech Report provides API access to forward thinking media partners, marketplace facilitators and service providers who want to enhance the value proposition of their products by providing verified Hotel Tech Report data to users. 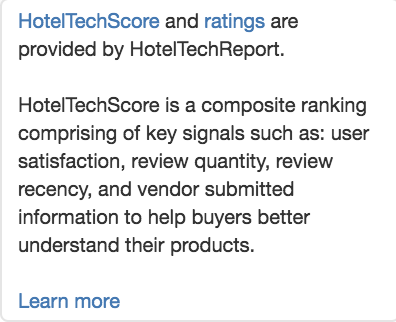 In order to add reviews to an index page without repeating the "powered by HotelTechReport" notation, partners may use the HotelTechScore and logo notation below. If you would like to have a pop-up explaining the HT Score to partners, you must use the following description.